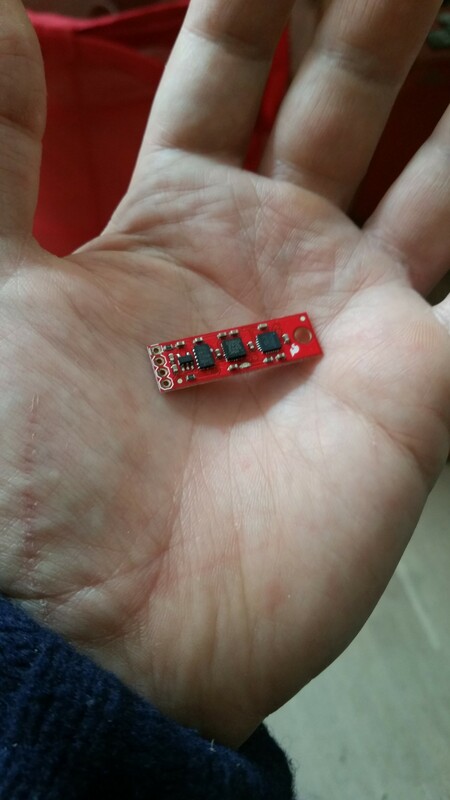 A couple of months ago, I finally set out to get the Sparkfun 9DOF stick working (3D acceleration sensor, gyroscope and magnetic flux sensor/compass: 3 x 3 = 9). I got it from my father for my birthday a couple of years ago. I used my new Raspberry Pi 2 to connect to it. All three can run on a 3.3V power supply and are connected together on an I2C bus. Both the supply line and the bus are broken out to the holes on the left. Here’s the complete setup. As you can see, I first tried to connect to the same I2C bus as the RTC/fan –the wires on the right–, before I discovered the address collision using i2cdetect. Hurdle #2: Writing some code to get actual orientation and motion values from the sensors. The code I came up with is here. It contains a C++ wrapper for the linux I2C interface, a class for each chip and small logging program. Hurdle #3: Calibration. The chips obviously output raw binary data that has to be converted to SI unit values for magnetic field strength, angular velocity and acceleration respectively. Some preliminary testing yielded these conversion values for this board. I would like to add some adaptive calibration since the sensors, in particular the gyro, seem to be sensitive to temperature or other external influences. Address 0x68 on bus 1 is the RTC and it displays UU indicating it is in use by the kernel driver as expected!. 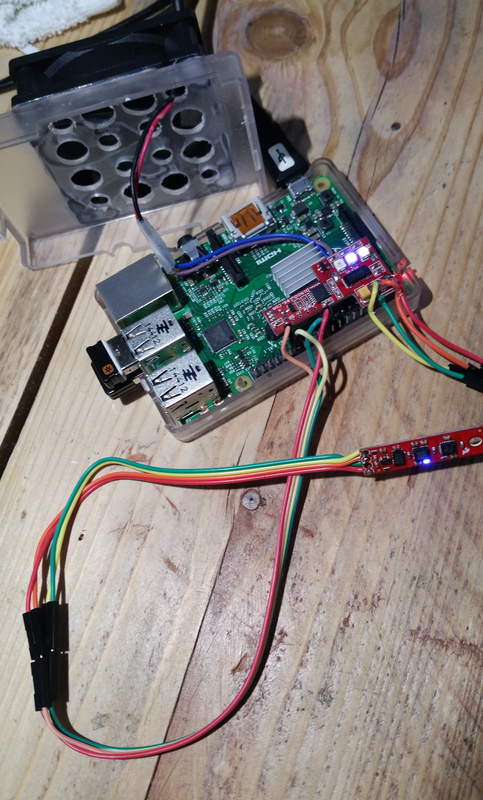 This entry was posted in Coding, Electronics, Raspberry Pi and tagged 9dof, acceleration, compass, gyro, i2c, raspberrypi, sparkfun. Bookmark the permalink.